Home » Blog » Copywriting » What’s seasonal SEO and why optimise your blog for it? What’s seasonal SEO and why optimise your blog for it? Looking for a new way to bring more traffic to your website? Have you tried seasonal SEO? It’s a strategy successful bloggers often use to increase exposure in search engine results — and increased visibility via social media. Seasonal SEO brings additional traffic to your website during – you guessed it – a specific season like Easter, Christmas and the End of Financial Year when these keywords are at their highest peak. You could even target a popular one-off event like a Kylie Minogue concert, a movie launch or when your favourite Royal comes to your city! If you have a beach house on offer for Easter weekend, you could adjust your SEO strategy and optimise your website to attract people who are searching for any of these keywords. Yes, I know it says “hotels…” but you could convince a mum or dad that it’s better to book a beach house when they have kids. Optimising your content could give an advantage over your competition because you’ll not only have content appearing in Google (therefore gaining a boost in your ranking) but you’ll also have relevant, current content to share on social media to drive traffic to your website. Want to know how to optimise your blog for seasonal traffic? What are you promoting that you could frame your blog post around or mention in your blog post? E.g. a post about baking for Easter to promote your new book on cake decorating. Before you do anything else, determine your end goal. What do you want readers to do once they’ve read your blog post? E.g. the post about baking for Easter motivates people to download your free ebook. Use Google’s Keyword Planner and Google Trends to dig for keywords people typed into Google last year… before, during and right after the seasonal period. So what did people search for this time last year in the lead up to the Easter season? E.g. the post about baking for Easter could use the keywords “Easter ideas”, “Easter cakes” and “how to decorate Easter cakes”. Here’s the trend in March-April 2014 for the keyword “Easter ideas” — it also shows the post “10 Easter ideas to give your kids an alternative treat to the usual choccy-fest“. 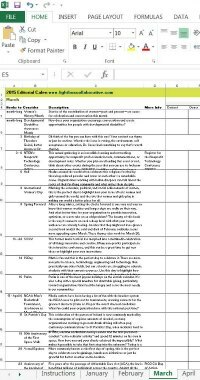 Do some topic research and write at least one blog post for the season. Also, prepare some graphics to accompany the post. You could use free images, paid images or design your own. If it’s possible, write it as an evergreen post so that the content can be easily re-shared next year without you needing to update it too much. Use your main keyword in the title, at least once in the body and if possible in your call to action. Do not overdo it by stuffing your post with the same keywords. If you have an SEO plugin, then go on and fill in the meta title and description. Are people mentioning the seasonal keywords? Are they sharing a lot of content in an effort to take people to various websites? What hashtags are they using? Could you use the same in your social media posts for further exposure? If so, optimise your social media posts with those keywords for increased traffic. Once the holidays are over, ‘forget’ the blog post. Don’t delete, hide or archive it. You’ll be using it next year. Just continue blogging as usual and let people find the seasonal post when they need it. That is, you don’t have to promote your Easter blog post during the Christmas season but it should still show up in search results if someone is looking for the content. Start a calendar for all the seasons (or occasions) coming up this year. Start with Australian Public Holidays and Days of the Year. Yup! Start writing your drafts for the next season or special day. You could use the post as a template for your next post (e.g. the Queen’s birthday) if you find that the layout worked well. Just write a new post with new keywords and BAM! You’re done in less than half an hour. Park it and then tidy it up closer to the big day. Think about seasonal GUEST blogging, which is when you write seasonal blog posts for other blogs! Hey… you want more traffic to your blog, right? Pitch to your fellow bloggers and grab seasonal traffic from their blogs. 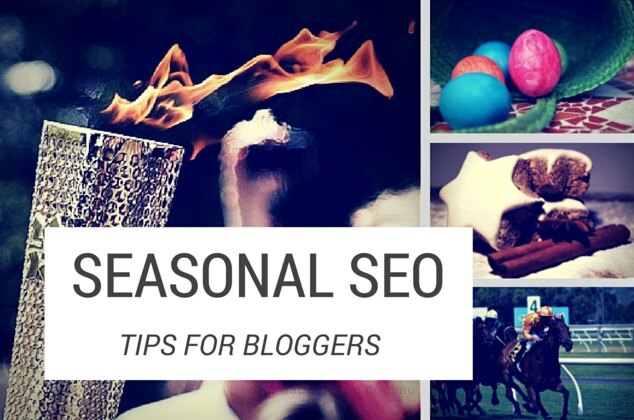 Seasonal SEO will benefit your blog year after year. Obviously you won’t be able to cover every single holiday. But you can determine which ones mean most to your readers, reflect your values and could bring more eyeballs to your services or products. They don’t have to be public holidays or religious days. You could target keywords associated with popular TV shows, industry events and your own events. So go on… Give it a go by writing for the next holiday. Don’t worry if you haven’t yet mapped out your SEO strategy, just write and publish useful content, use a strong headline and you’ll surely win some additional traffic. So how about you? Are you taking advantage of seasonal traffic for SEO? I never thought about the holidays in that way of being keywords. I’m still trying to figure out all of my SEO but thank you for the fantastic tips for the holidays. I never even thought of any of this before. Great tips Rhonda! You learn something new everyday! This is really useful! Thanks for the great tips! Great tips and a reminder to work your blog seasonally. I saw a significant increase in traffic over a Christmas post. No reason that couldn’t work for other seasons! thanks! Thanks for sharing these tips. Hope you can share them on the Merry Monday Link Party as all bloggers need to know about SEO. You are so great at figuring out this SEO. I learned a lot in this short post. I will have to explore more around the site. Thanks. I apply most of these and totally agree, great tips! Fantastic info! I learned so much. This is a great post with so many good things to keep in mind, especially for people who are new to blogging. xo! I really like your tips in this post! You have a lot of really good ideas for us bloggers! I am going to share this post with my link up participants! I think a lot of them will be interested in it! Thanks so much for sharing! I'll send you FREE writing tips and tools. RESOURCES TO HELP IMPROVE RESULTS! © 2018 Rhonda Chapman. CALL 0416513843.